Over the next 10 years, unmanned aircraft could fill a number of commercial and government uses here at home – but those uses don’t include putting ordnance on target, said James Williams of the Federal Aviation Administration. Williams, who is in charge of integrating unmanned aircraft into U.S. airspace, spoke at an event held by the Association for Unmanned Vehicle Systems International. Before the FAA allows their widespread use in U.S. airspace, tests need to be conducted on how unmanned aircraft can avoid other aircraft, he said. “You all know that, unlike manned aircraft, [unmanned aircraft systems]don’t have the capability to see and avoid other aircraft in the airspace, so research in these test ranges will include finding sense and avoid solutions to provide the same level of safety that manned aircraft have,” Williams said. The next decade could see the unmanned aircraft market become a $90 billion industry with the aircraft performing roles such as firefighting, search and rescue and border patrol, he said. 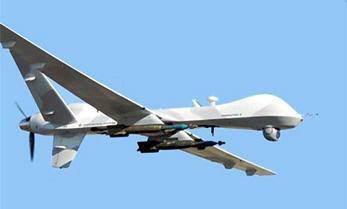 Does that mean that unmanned aircraft armed with Hellfire missiles could patrol the U.S. border? “Border patrol is the responsibility of customs and border protection and I’ll let them answer that question,” Williams said. As if I’m stupid enough to believe any government agency, employee or representative ever again.